If you like strong friendships with your cozies, this is a series you will enjoy. 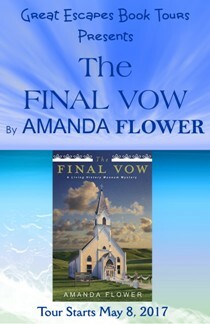 With drama and humor Amanda Flowers provides readers with another enjoyable read. 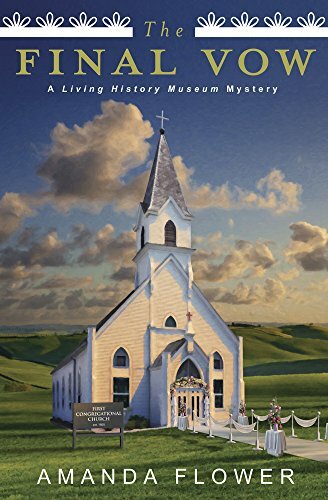 There were many twists and turns to keep me guessing, which is what I like in a cozy mystery. The ending came as a total surprise. Twists and turns I didn’t expect while trying to figure out who the killer was and why it was Vianna that had to die. 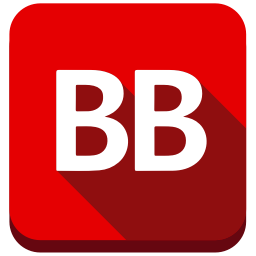 The pace of the story was very steady until the reveal, then my heart was beating rapidly and invisible steam was coming out of Kindle as I was quickly flipping pages. 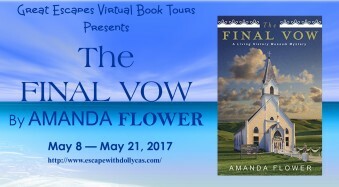 The Final Vow by Amanda Flower has all the essential ingredients that make for a good cozy mystery – picturesque location, small village setting, likeable characters (with the exception one or two who are frustrating), mystery that quickly hooks you – and I enjoyed it very much. This book was easy to read, flowed nicely, well written characters, and a great story line. I love the clues that are left throughout the book – and I enjoyed trying to figure out who did it. ~Because I said so — and other adventures in Parenting! This book is very addictive and kept me engaged until the end.